Objective: The objective of this study is to estimate the efficacy of Arthrocentesis and hyaluronic acid injections for the treatment of temporomandibular joint osteoarthritis. Method: 20 patients with TMJ Osteoarthritis underwent a cycle of five sessions (the first session consisted of Arthrocentesis plus injection of hyaluronic acid, but they remained sessions were restricted to injection of hyaluronic acid only). The scores for preoperative maximal mouth opening, and VAS scores for pain and mastication efficiency were compared with the end of the treatment and the follow-up scores obtained by the questionnaire and clinical examination to determine the efficacy of this protocol. Results: Distinct improvements were reported for all variables during the treatment phase, and these improvements were maintained over the 9-month follow-up period. Conclusion: This study proved the usefulness of Arthrocentesis and hyaluronic acid injections performed after for the treatment of TMJ osteoarthritis and maintained these improvements over a 9-month follow-up period. Osteoarthritis (OA) is a destructive process affecting the articular bone surfaces of the condyle, the glenoid space, or both. It happens as response of the body to increased articular loading . The signs and symptoms of degenerative joint disease of the temporomandibular joint (TMJ) include pain, stiffness, joint clicking, Crepitation and limitation of movement . Many conservative approaches have been proposed through the years, among which were occlusal splint therapy , physiotherapy , pharmacotherapy , and Arthrocentesis, which is carried out in degenerative joint diseases to remove the inflamed synovial fluid from the joint space, to provide appropriate synovial fluid viscosity, and to remove the adhesions by the application of hydraulic pressure . Now it is recognized as first line surgical intervention in patients who do not respond to conservative management . On the other hand, recent reports have pointed out the importance of joint lubrication for a correct joint function so the increasing in joint friction coefficient is a main risk factor for degenerative joint pathologies . Hyaluronic acid is an essential component for joint lubrication by reducing joint friction ; therefore, the theories supporting the role of viscosupplementation in the treatment of TMJ disorders have led to the introduction of hyaluronic acid injections, alone or combined with Arthrocentesis . a. This study was carried out with the approval of the Aleppo University Ethics Committee, and informed consent was obtained from all patients. b. 20 patients (4 males, 16 females) included in this study had been referred to Department of Oral & Maxillofacial Surgery, Faculty of Dentistry, University of Aleppo with a diagnosis of TMJ osteoarthritis according to clinical and radiological criteria (MRI) . i. Clinical criteria included: Crepitation sounds from joint; Restricted mouth opening capacity; Pain from joint areas. ii. Radiological criteria included: Disc displacement; degenerated or absent; Abnormal cortical bone in both joint components; most evident in condyle (cortical erosion, flattened condyle, osteophytosis, sclerosis). c.	All the patients did not respond to nonsurgical treatment for at least 3 months (pharmacotherapy and occlusal splint therapy). d.	Medical and dental histories were recorded, including general personal information, and meticulous examination of the temporomandibular joint was carried out.The treatment protocol included a cycle of five weekly sessions, the first session consisted of Arthrocentesis with 50ml of Ringer lactate then injection 1ml hyaluronic acid and the remained four sessions consisted of injection 1ml hyaluronic acid only, and four follow-up assessment after the end of the treatment (at 1 month, 3 months, 6 months, and 9 months)The hyaluronic acid used in the present investigation, Hyalgan is viscous solution consisting of a high molecular weight (500,000-730,000 Daltons) fraction of purified natural sodium hyaluronate in buffered physiological sodium chloride having a pH of 6.8-7.5. Hyaluronic acid is a natural complex sugar of the glycosaminoglycan family and is a long-chain polymer containing repeating disaccharide units of Na-glucuronate-N-acetyl glucosamine. e.	Preoperative maximum mouth opening (MMO) in mm was measured as the distance between the incisal edge of the upper and lower central incisors, visual analog scale (VAS; range 0-10) of the existing pain at rest and the mastication efficiency were recorded. These clinical parameters were assessed by the same operator at the time of diagnosis (baseline), at each appointment during the treatment and at each appointment during follow-up (1month- 3months- 6months- 9months). In the first session, an intravenous sedation was employed as an adjunctive measure for patient comfort; the skin surface was disinfected with povidone iodine. Once the joint was locally anaesthetized two points were then marked over the articular fossa and eminence along the canthal-tragus line, similar to the entry points used for arthroscopic procedures. A 21-gauge needle was then inserted into the Upper Joint cavity (UJC) at the glenoid fossa and approximately 2mL of Ringer’s solution was injected to distend the UJC and some movements were carried out to the mandible of patient to mix the saline solution with the synovial fluid. Then the second 21-gauge needle was inserted in the area of the articular eminence to establish a free flow of the irrigating solution through the UJC. The joint was irrigated with 50mL of Ringer’s solution, and to affect lysis of adhesions during lavage, the outflow needle was intermittently blocked to help distend the UJC by injecting under pressure. At the end of lavage, 1ml hyaluronic acid was injected. Immediately on completion of the procedure and after the needles were removed, the patient’s mandible was gently manipulated to help further free up the disk. In the remained sessions, the joint was locally anaesthetized, and 1ml hyaluronic acid was injected in the Upper Joint cavity (UJC) at the glenoid fossa. During the treatment phase and the follow up phase, we did not make any physiotherapy or splint therapy. We assumed Arthrocentesis had successful outcome when we met these two criteria: maximal mouth opening (MMO) ≥35 mm and pain reduction ≥50% at the end of the treatment (after the fifth injection), and during 9 months follow up period. a. The age range of the patients was from 20 to 61 years old, with a mean of 42.65 years. b. There were no complications in any of the study groups, and marked improvements were reported for all outcome variables, objective variables (maximum mouth opening) and subjective variables (pain at rest and the mastication efficiency), during the treatment phase, and these improvements maintained over the 9-month follow-up period (Table 1 and 2). Table 1: Mean and standard deviation values of clinical responses during the treatment. Table 2: Mean and standard deviation values of clinical responses during the follow up. Maximum mouth opening: In maximum mouth opening (in mm), the mean value before the first injection was 29.60±5.68 mm, increased to 35.45± 6.88 mm (after a week of the fifth injection). The mean value increased slightly after the treatment phase during the 9 month follow up period, and the final value was 36.25±7.210 mm (Figure 1). Pain at rest: The pre treatment mean pain levels at rest were 6.45±1.36. A reduction in the mean pain at rest emerged to 2.15±1.5 (after a week of the fifth injection). The mean pain at rest values decreased more slowly after the treatment phase during the 9 month follow up period. The final value was 2.00±1.84 (Figure 2). Mastication efficiency: The pre treatment mean mastication efficiency levels were 3.1±0.91. An increase in the mean mastication efficiency emerged to 7.25±1.55 (after a week of the fifth injection). 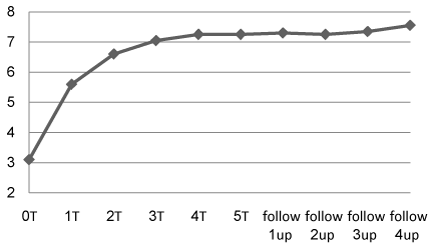 The mean mastication efficiency values increased more slowly after the treatment phase during the 9 month follow up period, the final value was 7.55±1.76 (Figure 3). Figure 1: Mean values of maximum mouth opening (MMO). Figure 2: Mean values of pain at rest. Figure 3: Mean values of mastication efficiency. Statistical analysis: The purpose of the analysis was to test the treatment effects over time. The null hypothesis is that the variables have the same joint distribution with respect to time (i.e. there is a null treatment effect). The alternative hypothesis is that the treatment has a significant improvement (increasing or decreasing) on the variables. Significance was set at p-value < 0.05, for all statistical analysis, the SPSS package (17.0 Version) was used. The Paired-Samples T test was used to compare means of maximum mouth opening during the therapy and the 9 month follow-up period; (parametric solution was used because the data follow a normal distribution). The Wilcoxon test was used to compare means of pain at rest and mastication efficiency during the therapy and the 9 month follow up period; (nonparametric solution was used because the data do not follow a normal distribution). 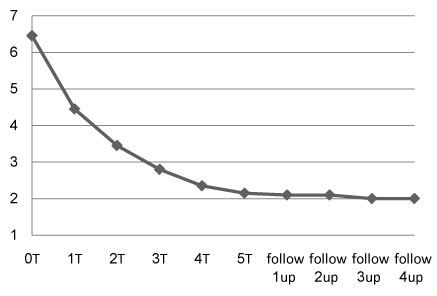 Parametric test: The p value for the maximum mouth opening from the beginning of treatment to the end of treatment was less than 0.05, and p-value for the maximum mouth opening from the beginning of follow-up to the end of follow-up was less than 0.05, thus allowing the rejection of the hypothesis of null treatment effect in favor of the alternative hypothesis of positive effect (Table 3). 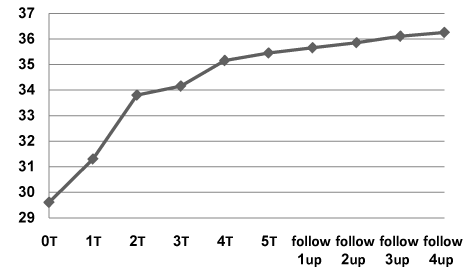 Nonparametric test: The p-value for the pain levels at rest and mastication efficiency from the beginning of treatment to the end of treatment was less than 0.05, but the p-value for the pain levels at rest and mastication efficiency from the beginning of follow up to the end of follow up was greater than 0.05 (Table 4 and 5). Table 3: p-values of Paired-Samples T test for Maximum mouth opening. Table 4: p-values of Wilcoxon test for the pain level. Table 5:p-values of Wilcoxon test for mastication efficiency. Many conservative treatments have been suggested to deal with temporomandibular disorders (TMD), but the turning point towards Arthrocentesis occurred since there were improvements in the clinical parameters of the patients who had arthroscopy although there were not any alterations or repositioning to their disks . The theories which talk about the defect of the lubricating ability of the synovial fluid during the degenerative process and the role of this defect in exacerbating temporomandibular disorders lend further support to the use of hyaluronic acid injections as viscosupplementation approach . In this regard, Alpaslan and Alpaslan  found that patients with TMJ internal derangement (ID) benefited from Arthrocentesis with or without injection of hyaluronic acid in terms of relief of pain. But, they concluded that Arthrocentesis with hyaluronic acid injection seemed to be superior to Arthrocentesis alone especially in patients with TMJ Closed Lock and this was ascribed to a faster and longer effect of hyaluronic acid on pain relief. Besides, intraarticular injection of hyaluronic acid caused significant reduction in the nitric oxide (NO) level in the synovial fluid, whereas no significant decrease in these levels was found in patients receiving Arthrocentesis only . In our study we made a modified protocol between the protocols of Guarda-Nardini et al. (Arthrocentesis with 1ml hyaluronic acid injection once a week for 5 weeks), and the protocol of Sato et al. (1ml hyaluronic acid, one injection per week for 5 weeks), and significant and constant improvements were achieved in patients with temporomandibular osteoarthritis. And the success rate for our study was 70% according to our previous criteria. We can elucidate the positive outcomes of this study since washing out the upper joint cavity will eliminate inflammation mediators from the synovial fluid which will reduce pain, and the hydraulic distention during Arthrocentesis will increase mandibular mobility by removing intra-articular adhesions, getting rid of the negative pressure within the joint between the disk and the fossa space (vacuum effect), which reduces the mechanical obstruction and improving jaw mobility, thereafter injection of hyaluronic acid will reduce the inflammatory mediators and improve lubrication ability of the synovial fluid. The improvement of mouth opening was statistically significant, and took gradual manner since the patient had destructive lesion which happened during several years and he needed indolent joint promoting him to improve the range of motion of his jaw, and this gradation may throw a question about the usefulness of mouth opening exercises if they accompanied such protocols, although Sato found mouth opening exercise did not contribute to better outcomes in patients with non reducing displacement who underwent pumping of the TMJ . In our study, we found that pain is the main complaint of patients with osteoarthritic disorders, and the reduction in this parameter was statistically significant. A randomized clinical trial should be undertaken to compare the different treatments, and since there is absence of control groups receiving only one type of our protocol (Arthrocentesis, or hyaluronic acid injections), it made difficult to decide which of the two procedures was the most effective, but the prime reduction in pain parameter took place after the first session (Arthrocentesis plus injection of hyaluronic acid), so we think that Arthrocentesis was the effective part of our protocol, and injection of hyaluronic acid took the complemented part, so the patient who will respond to this protocol will change for better after the first session, and if he will not get better we should advise him to discontinue this protocol, and search for alternative treatment. We conclude that maximum mouth opening, even though statistically significant, has little importance clinically, since our baseline values were almost normal for most patients, but the reduction in pain and the increase in mastication efficiency (the main complaints of patients with inflammatory-degenerative disorders) are notable results. These improvements lend further support to the efficacy of serial hyaluronic acid injections performed after Arthrocentesis for the treatment of TMJ osteoarthritis. Poveda RR, Diaz Fernandez JM, Hernandez Bazan S, Jimenez Soriano Y, Margaix M, et al. (2008) A review of temporomandibular joint disease (TMJD). Part II: Clinical and radiological semiology. Morbidity processes. Med Oral Patol Oral Cir Bucal 13(2): E102-E109. de Bont LG, Dijkgraaf LC, Stegenga B (1997) Epidemiology and natural progression of articular temporomandibular disorders. Oral Surg Oral Med Oral Pathol Oral Radiol Endod 83(1): 72-76. Turp JC, Komine F, Hugger A (2004) Efficacy of stabilization splints for the management of patients with masticatory muscle pain: a qualitative systematic review. Clin Oral Investig 8(4): 179-195. Nicolakis P, Erdogmus CB, Kopf A, Nicolakis M, Piehslinger E, et al. (2002) Effectiveness of exercise therapy in patients with myofascial pain dysfunction sindrome. J Oral Rehabil 29(4): 362-368. Dionne RA (1997) Pharmacologic treatments for temporomandibular disorders. Oral Surg Oral Med Oral Pathol Oral Radiol Endod 83(1): 134-42. Yura S, Totsuka Y, Yoshikawa T, Inoue N (2003) Can arthrocentesis release intracapsular adhesions? Arthroscopic findings before and after irrigation under sufficient hydraulic pressure. J Oral Maxillofac Surg 61(11): 1253-1256. Dimitroulis G, Dolwick MF, Martinez GA (1995) Temporomandibular joint arthrocentesis and lavage for the treatment of closed lock: a follow-up study. Br J Maxillofac Surg 33(1): 23-27. Nitzan DW (2001) The process of lubrification impairment and itsinvolvement in temporomandibular joint disc displacement: a theoretical concept. J Oral Maxillofac Surg 59(1): 36-45. Nitzan DW, Kreiner B, Zeltser R (2004) TMJ lubrication system: its effect on the joint function, dysfunction, and treatment approach. Compend Contin Educ Dent 25(6): 437-438, 440, 443-4 passim; quiz 449, 471. Cascone P, Fonzi Dagger L, Aboh IV (2002) Hyaluronic acid’s biomechanical stabilization function in the temporomandibular joint. J Craniofac Surg 13(6): 751-754. Larheim TA, Westesson PL (2006) Maxillofacial Imaging (1st edn). Springer, Heidelberg, Germany, pp. 440. Nitzan DW, Dolwick MF, Martinez GA (1991) Temporomandibular joint arthrocentesis: A simplified treatment for severe, limited mouth opening. J Oral Maxillofac Surg 49(11): 1163-1167. Alpaslan GH, Alpaslan C (2001) Efficacy of temporomandibular joint arthrocentesis with and without injection of sodium hyaluronate in treatment of internal derangements. J Oral Maxillofac Surg 59(6): 613-618. Alpaslan C, Bilgihan A, Alpaslan GH, Guner B, Ozgur Yis M, et al. (2000) Effect of arthrocentesis and sodium hyaluronate injection on nitrite, nitrate, and thiobarbituric acid-reactive substance levels in the synovial fluid. Oral Surg Oral Med Oral Pathol Oral Radiol Endod 89(6): 686-690. Guarda Nardini L, Stifano M, Brombin CP, Salmaso L, Manferdini D (2007) A one-year case series of arthrocentesis with hyaluronic acid injections for temporomandibular joint osteoarthritis. Oral Surg Oral Med Oral Pathol Oral Radiol Endod 103(6): 14-22. Sato SH, Oguri S, Yamaguchi K, Kawamura H, Motegi K (2001) Pumping injection of sodium hyaluronate for patients with non-reducing disc displacement of the temporomandibular joint: two year follow-up. J Craniomaxillofac Surg 29(2): 89-93. Sato SH, Kawamura H (2008) Evaluation of mouth opening exercise after pumping TMJ in patients with non reducing disk displacement. J Oral Maxillofac Surg 66(3): 436-440.